If I encounter a polar bear I’m supposed to stay calm. Really? I’m supposed to back away slowly, facing the bear at all times. The worst thing to do: run. No problem. I’m so encased in down and polar fleece, I can barely walk. My best escape plan is to locate the nearest vehicle or house. People in Churchill leave everything unlocked, I’m told, just for this scary possibility. Churchill, Manitoba clings to a strip of land along the shores of Hudson Bay. It’s home to approximately 1,000 hardy people who, at different times of the year, live in close proximity to over 1,000 polar bears from the Western Hudson Bay. Churchill is Canada’s northernmost sub arctic seaport and can be reached by plane or a thirty-some hour train ride from Winnipeg. There are no roads to Churchill. Churchill is the site of Prince of Wales Fort: the first permanent settlement in the area and now a national historic site of Canada. It was built in the 1700s to protect fur trading interests of the Hudson Bay Company. In 1782, three French warships surprised the fort and its governor surrendered without incident. The French abandoned the fort and it was never occupied again. 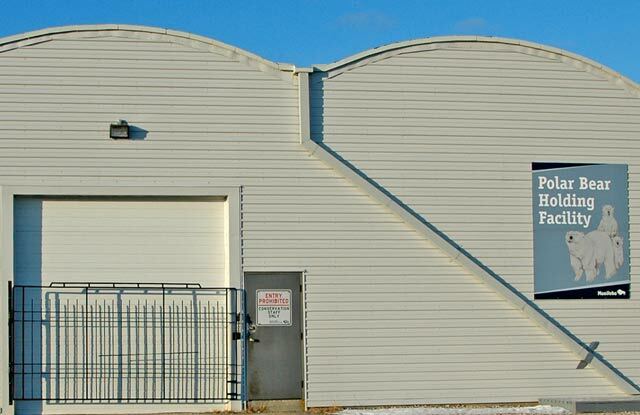 The Polar Bear Holding Facility is known locally as Polar Bear Jail. 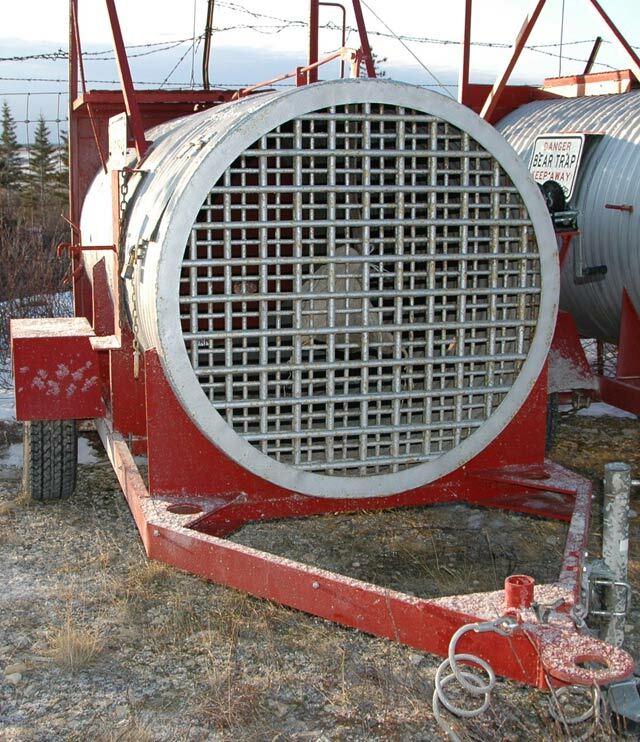 Bears observed wandering too close to town are trapped and placed in jail until the time is right for them to be tranquilized and airlifted north of town or out to the ice. I stand close to the building and listen to loud banging sounds. A little pesky thought creeps across my mind: the bears — making all of this racket — were heading toward town. I’m suddenly aware of all my surroundings and glance over my shoulder a few times. 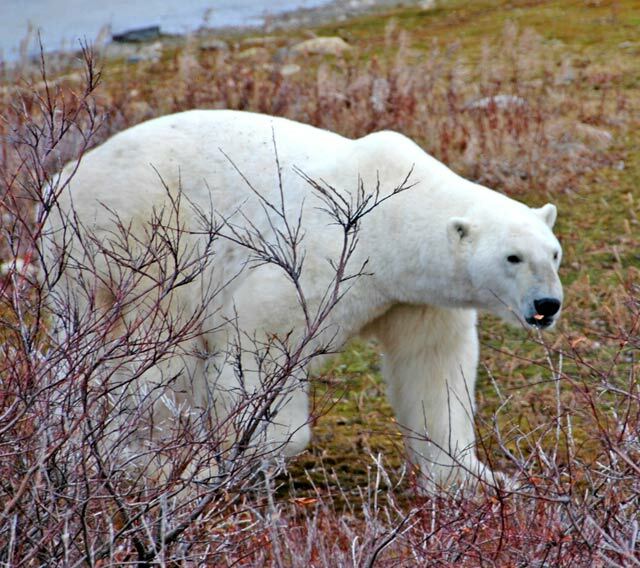 During summer months when the ice breaks up, polar bears come ashore south of Churchill and travel inland and along the coast. Pregnant females and mothers with cubs leave the ice at Wapusk National Park for their denning areas. In the fall, polar bears begin a journey back toward Hudson Bay and hunting grounds on the ice. Polar bears congregate around Churchill waiting for Hudson Bay to freeze and tourists congregate in Churchill waiting for the bears to return. There is about a six-week window of opportunity when tourists can view a polar bear up close and safely from a tundra vehicle that resembles a super-size shoe box on monster tires. We bounce along on what are called “established” trails, crisscrossing never-ending tundra in Churchill Wildlife Management Area only yards away from its enormous inhabitants. The wildness of the landscape is extraordinary from any angle but to actually see the vastness, the groups of polar bears, even moose is an overwhelming experience when viewed from a helicopter. 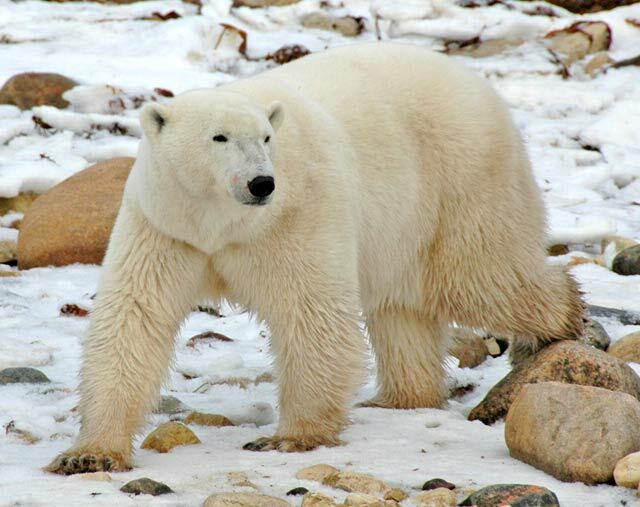 Polar bears are the world’s largest land predators. They are intelligent and curious and may be as interested to see us as we are to see them but for different reasons. We look at them in awe as a great photo op and they look at us as a skinny snack. They have been known to try and get a closer look at tourists by learning how to climb on tires, open doors, and slide windows. 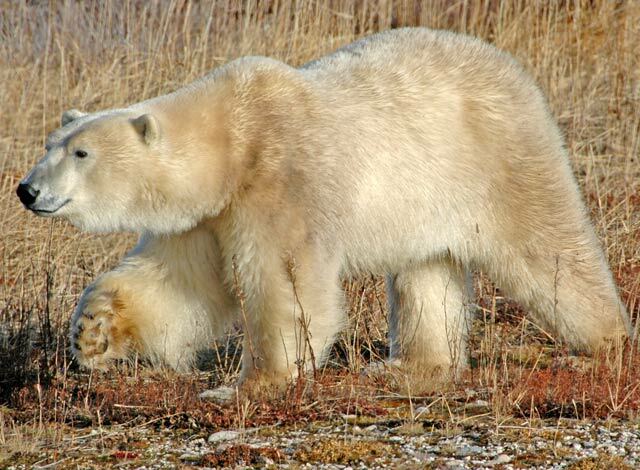 Male adult bears of Hudson Bay are approximately seven-and-a-half feet in length, and they may reach 12-feet-tall when standing on their hind legs. Most weigh between 880 and 1320 pounds. Females are smaller and weigh between 330 and 550 pounds. Polar bears are scavengers, but their main diet is the ringed seal. It’s only a few wind-blown blocks from the Aurora Inn to the Eskimo Museum, Gypsy Bakery, Northern Images, and Arctic Trading Company, but I have made it a habit to sweep every neighborhood on each trip. I calculate the distance to all parked vehicles and houses along the way. My eyes dart across the horizon searching for large white objects one last time and then I climb into a van heading out of town to the Churchill airport. Joy Ehle’s trip was arranged through International Wildlife Adventures and Tundra Buggy Adventures/ Frontiers North. Hudson Bay Helicopters offers wildlife viewing flights over the Churchill Wildlife Management Area and Wapusk National Park.